The future is arriving much sooner than many thought, as the new and popular eMoney Bitcoin can now be used to bet on sports at the BitCasino.io sportsbook. The online casino is the first legally licensed and regulated Bitcoin-only gamlbing operator, and launched their sports betting services on August 8th, right in time for the start of the English Premiership football season. For those thinking there won’t be as many options as other books offer, BitCasino.io will actually offer over 10,000 live betting markets, including the popular football and eSports. 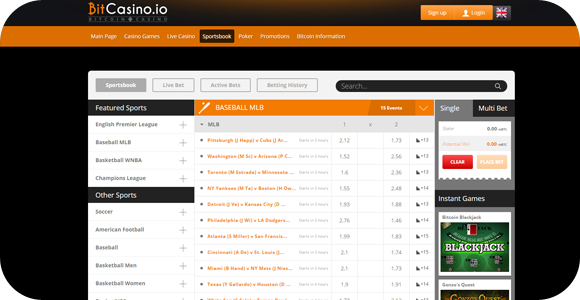 It has been a huge hit among bettors, as they have a member base of over 100,000 users. The great news is that Bitcoin is quickly becoming a legal form of currency, and for those in the UK, this digital currency is actually covered by the UK’s gambling regulations. The use of bitcoin has made transactions much quicker and safer, as they have instant deposits and cash-outs, unlike fiat based operators. For those that know how to use bitcoin and want to place a few bets, be sure to join the first bitcoin-only sportsbook for all your sports action. BitCasino.io is even giving away 20,000 mBTC in a way to promote their great services.